Singing Rooster News – Haitian coffee, chocolate, art What's better than a Silent Auction? What’s better than a Silent Auction? We know you’re in the middle of fundraising season. We also know the HOURS (days, months) you’ve spent on the (staff dreaded) silent auction. If you’ve ever questioned the cost-benefits of the silent auction, we have a solution. This year at your annual gala – put up a small marketplace / table of goods sourced directly from people (artisans, farmers) who benefit from sales. A producer-direct marketplace is the perfect alternative: you save valuable time while raising money and folks go home with something special. The added benefit of building self-sustainability where your nonprofit works is icing on the cake. 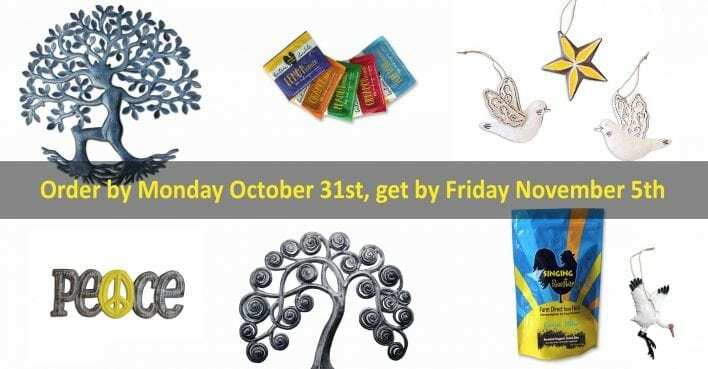 Any order placed by Monday October 31st, 3 pm will arrive on or before Friday, November 5th. When your big event is over and you’ve added up the time you spent hunting down different price point items, pricing them, writing and framing descriptions, pulling together the auction book (while items are still coming in), coordinating the checkout process, getting donors to send items… then consider something new in 2017. We can help you think through the details. read through our FAQs — we have some great details here! registration/login allows you to track past orders, print invoices, etc. If you have a facility on the ground in Haiti (guesthouse, orphanage, boutique, clinic, office), we wholesale Haitian coffee in Haiti too.